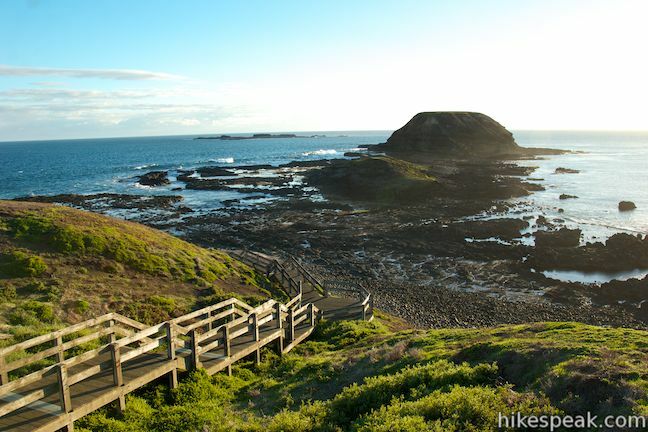 Phillip Island in Victoria, Australia has a lot to offer its visitors, like beautiful coastlines and the internationally-heralded Penguin Parade. 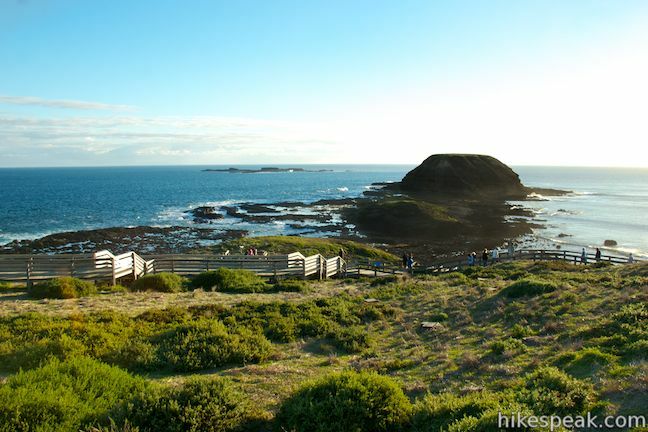 Point Grant, the western tip of Phillip Island is just a few kilometers past the Penguin Parade facilities at Summerlands Beach and home to a seal colony, dramatic sea bluffs, and panoramic ocean views. 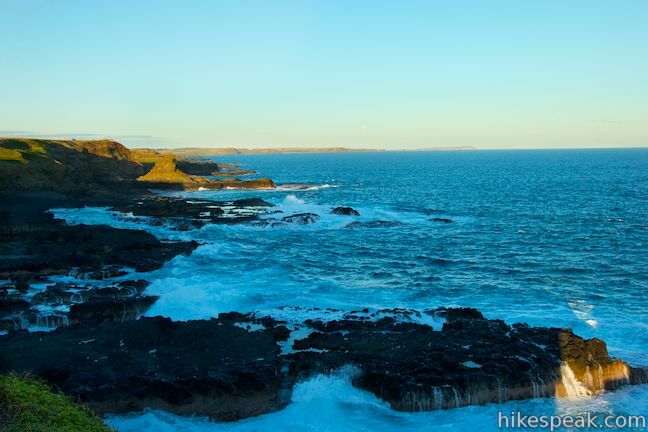 Point Grant is better known as the Nobbies, a name that comes either from the domes at the end of the point or from areas of cobblestone rocks that can poke out of the water like knobs when the tide is at the right level. 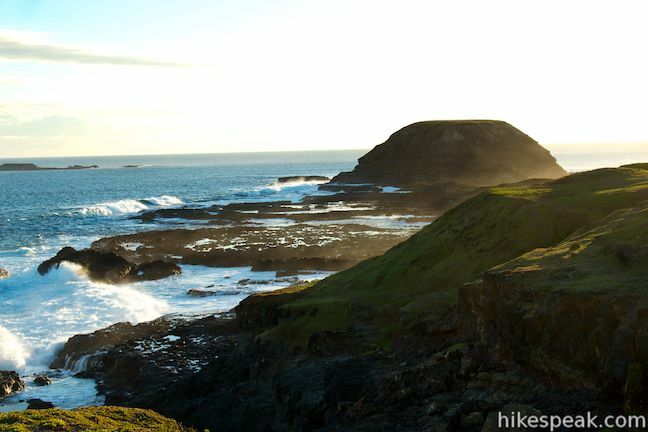 A pair of small islands off the end of the point called the Seal Rocks provide a home to one of the largest fur seal populations in Australia. 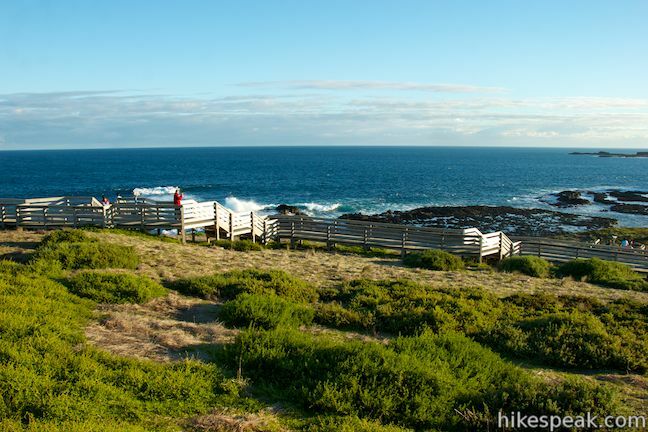 Explore Point Grant’s scenery on a one-kilometer walk (with 15 meters of elevation change) along a boardwalk that providing views of Seal Rocks, Nobbies, and the Nobbies Blowhole, a billowing sea cave along the coast. 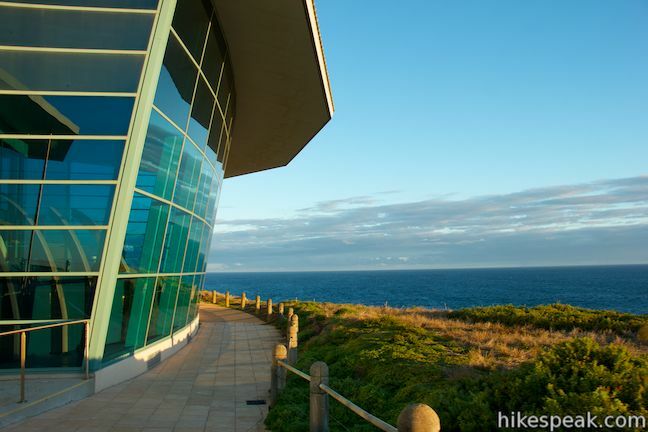 The walk begins next to the Nobbies Centre, a large visitor center and cafe built at the end of the road to Point Grant. 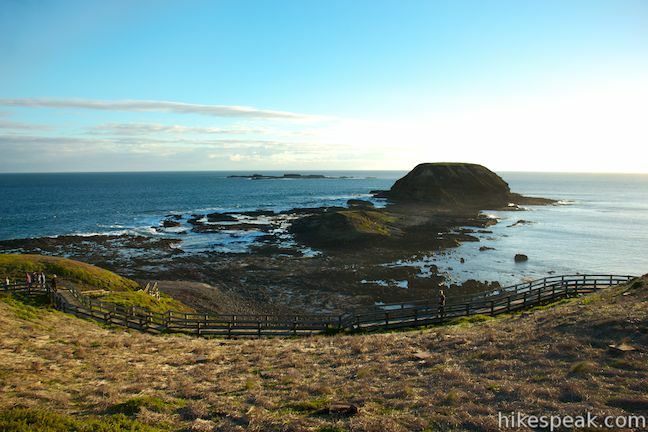 There are viewing scopes at the start, so bring a few coins and see if you can get a closer look at the fur seals on the Seal Rocks, about 1.5 kilometers off the coast. After the short switchback, you will come a junction at the start of the loop in the boardwalk. 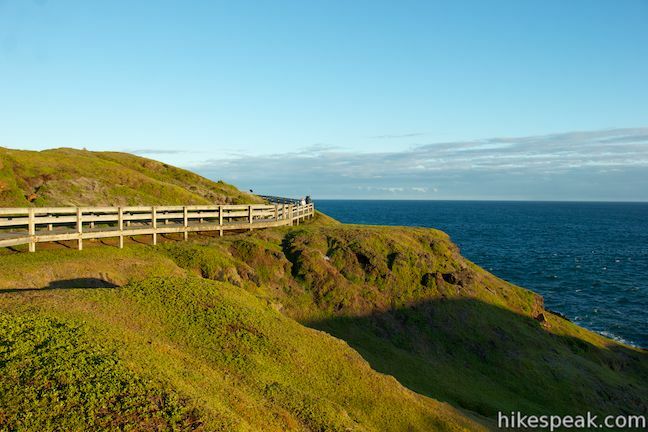 You can continue in either direction from here, but if the Nobbies are calling you closer, turn right to proceed farther out on the point, saving the boardwalk to the right for the end of the loop after the side trail to the Nobbies Blowhole. The boardwalk heads downhill across the grassy bluff. 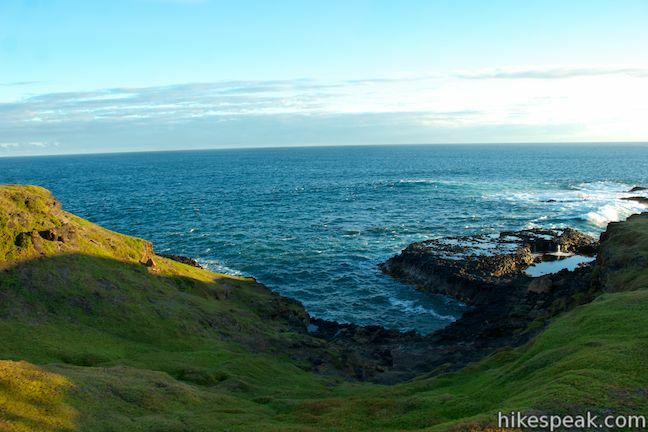 Along the shore below, waves roll up against dark cliffs of basalt rock. 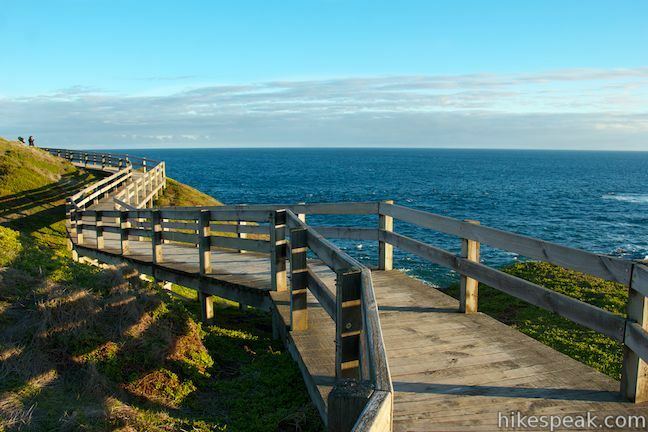 After 150 meters, the loop passes a section of the boardwalk that ventured down closer to the Nobbies. This extra bit of boardwalk may be closed. There are good views off Point Grant without this extension. 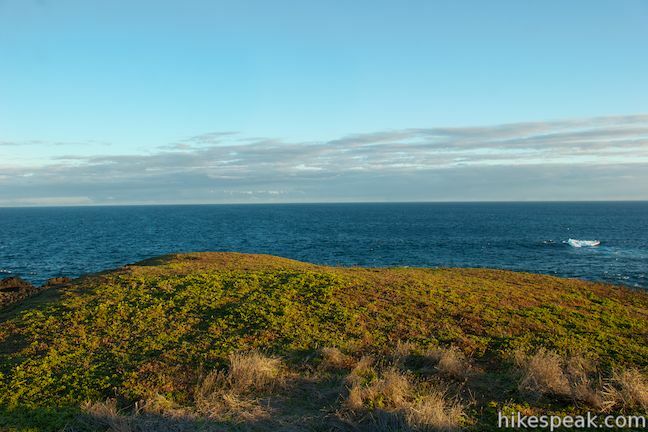 Below the grassy bluffs, you’ll spot a cobblestone shore with puddles of ocean water. 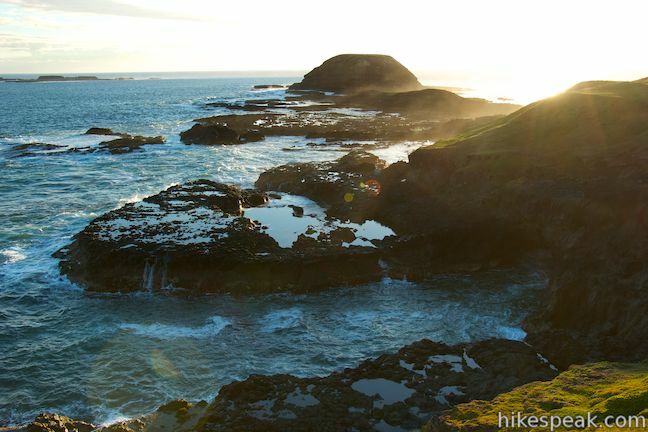 Off the end of Point Grant, to the left of the large domes of black rock, there are a few small islands known as the Seal Rocks, where a colony of fur seals can often be spotted. 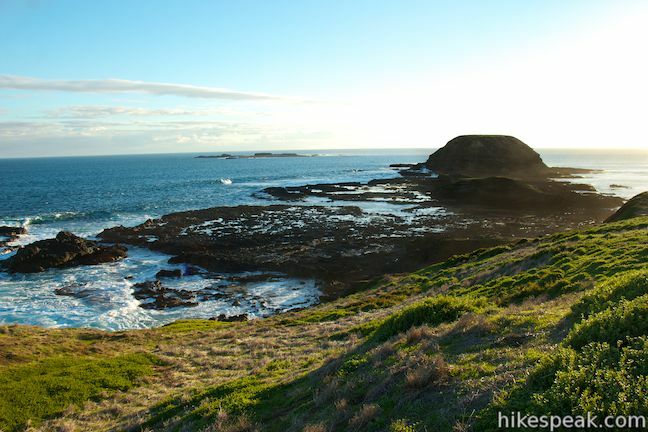 Silver gulls, crested terns, and little penguins also appear at the Nobbies on occasion. 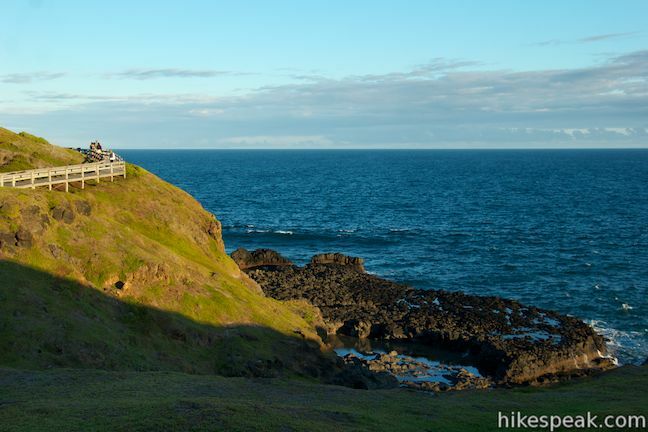 When you’re not staring at the ocean, you may spot a few houses for seabirds built into the side of the hill. The loop proceeds to the southern coast of Point Grant where a pair of overlooks offer views toward the Bass Straight. 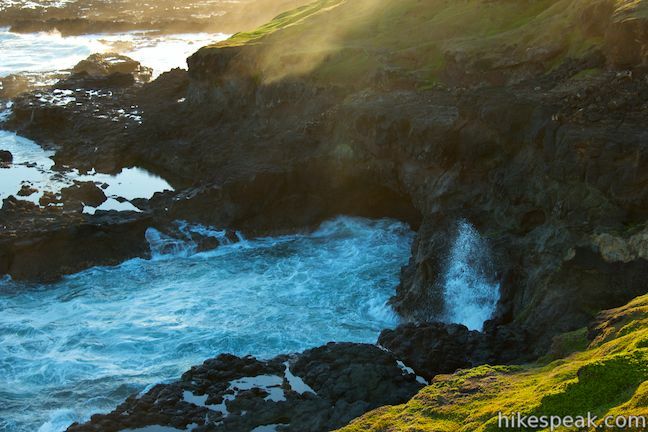 Determined waves crash into rock formations below the cliffs to create a dramatic coastal scene. Head up steps from the overlooks and you will come to another junction. 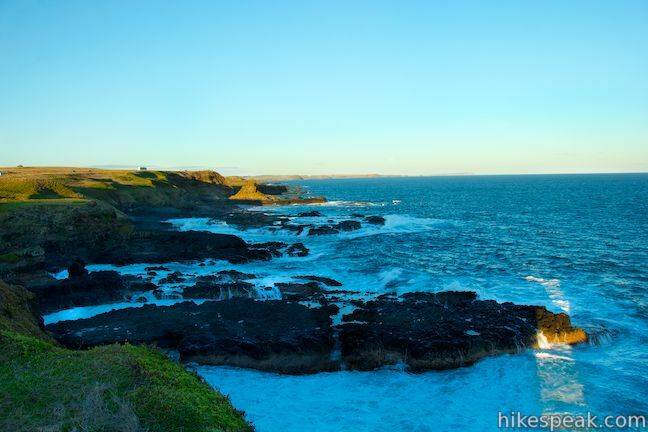 The loop continues to the left, but turn right if you would like to take a side trail to the Nobbies Blowhole and an overlook with views down the southern coast of the island. The hike would be half a kilometer long without this extension and is one kilometer long with it. 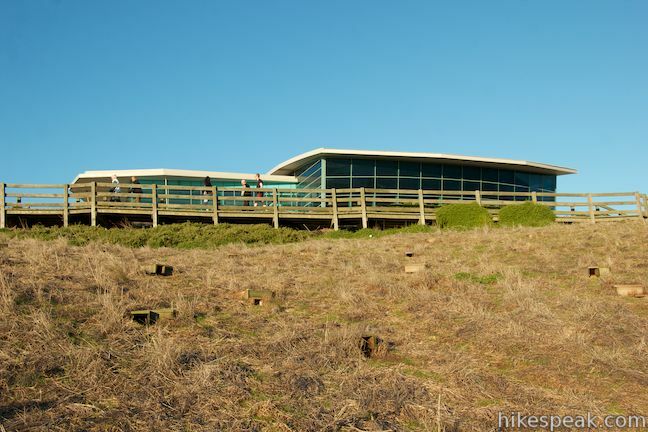 The boardwalk passes through (and helps preserve) a fragile carpet of greenery perched atop the coastal bluffs. A panel along the trail explains that these “Seabird Gardens” of Poa tussock, Bower spinach, and noon flower are fertilized by bird droppings. The plants trap small amounts of dirt (and bird dirt) as they cling to the ground, creating a soil base and a habitat for wildlife. 1. 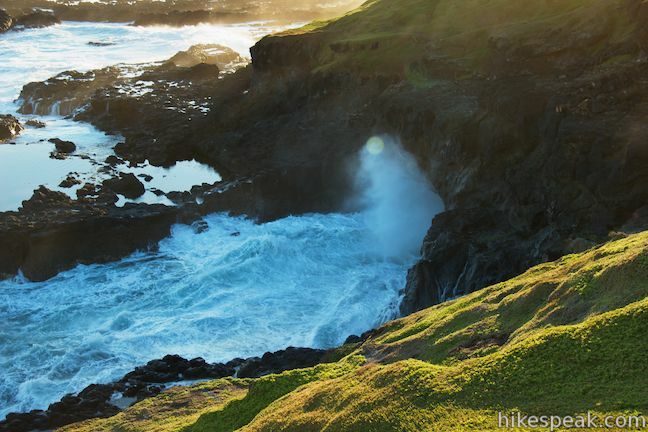 A large wave enters the blowhole. 2. The wave fills the tunnel from floor to ceiling, compressing air against the rear wall. 3. The wave hits the near wall and rebounds, its speed increased by the explosive force of the compressed air. This creates a jet spray from the tunnel entrance. 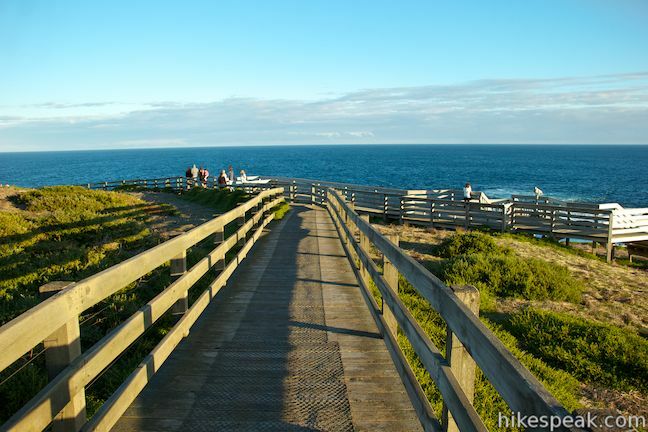 Beyond the blowhole, the boardwalk takes one final turn to the left and comes to a lookout facing west along the lovely southern coast of Phillip Island. 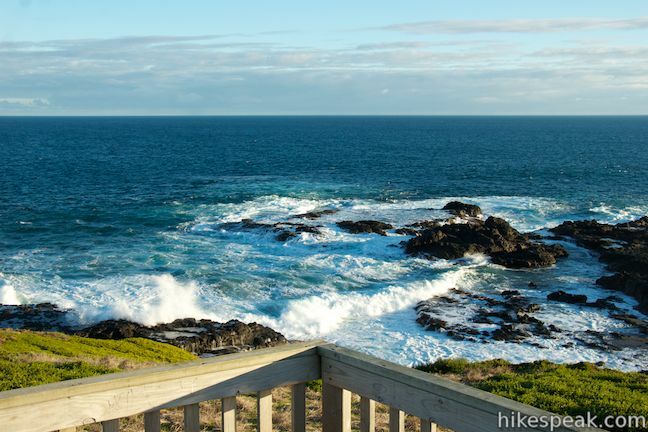 From this excellent vantage point, one can look approximately 25 kilometers down the wave-battered coast to Cape Woolamai, a headland extending off the southeast end of the island. The coastline ahead is a rugged undulating wall of black sea cliffs between green grassy bluffs and blue ocean waves. 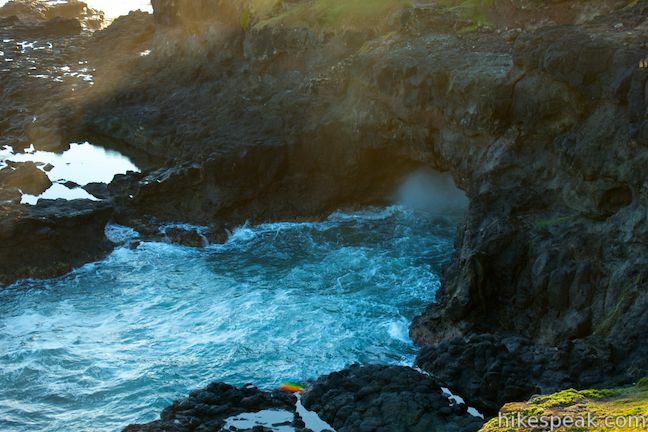 The dramatic cliffs are made up of dark basalt that formed from cooling lava 50 million years ago. 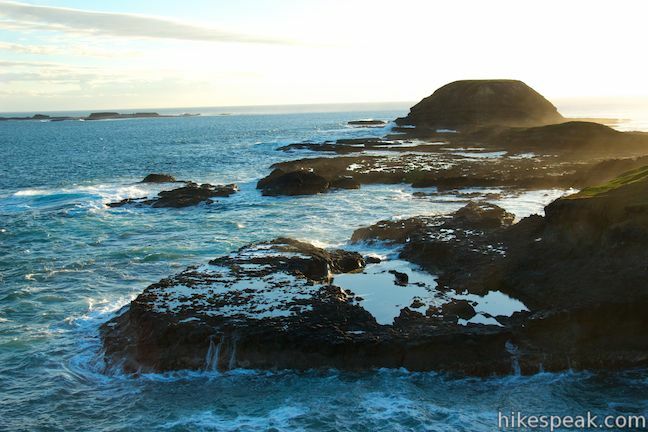 Below the overlook, you’ll spot a large rock platform, the footprint of an old sea cliff that was eroded away by the ocean. 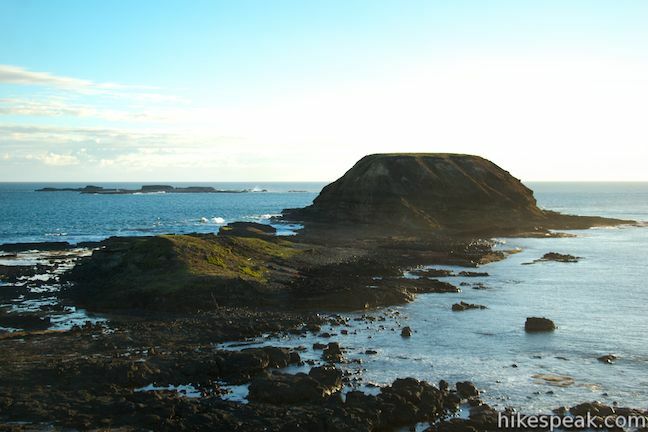 Farther down the coast you’ll see Pyramid Rock, a triangle-shaped sea stack just off the coast of Phillip Island. 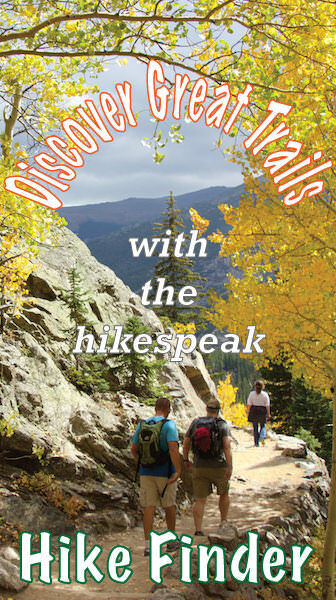 Pyramid Rocks sits off a point that can be explored via boardwalks to a pair of Pyramid Rock Lookouts. 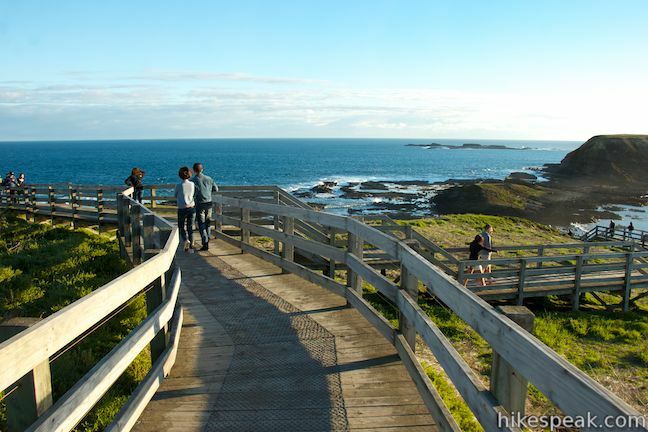 The boardwalk ends here, so once you’ve taken in the view, it’s time to walk back the way you came, past the Nobbies Blowhole and through the Bird Colony Succulent Herbland. When you return to the junction with the loop in the boardwalk, turn right to complete the circuit. 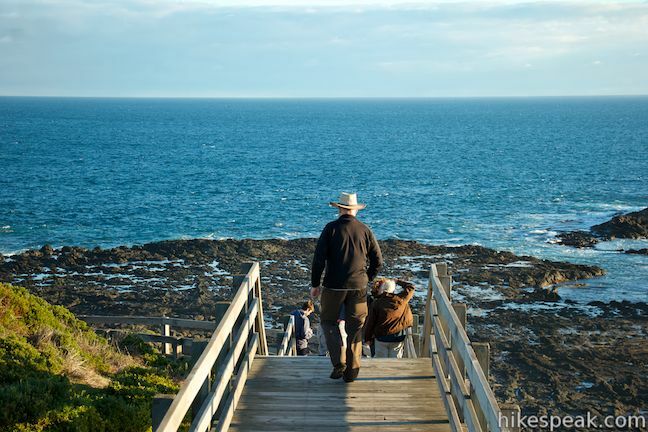 After 150 meters, turn right again to return to the Nobbies Centre where the walk began, completing the one-kilometer long boardwalk stroll. 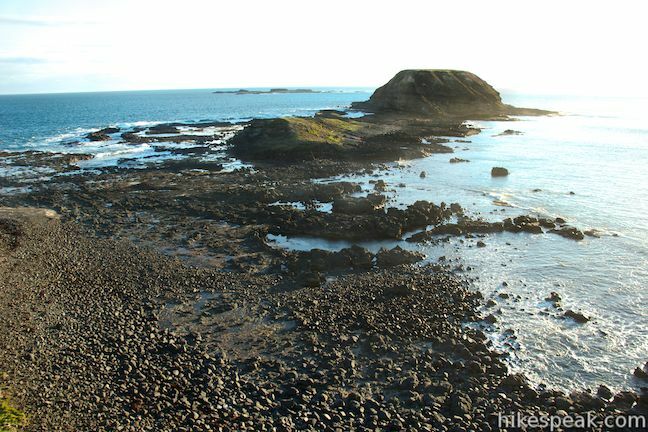 During operating hours (daily from 11 a.m. to roughly one hour before sunset), you can go inside the center and learn more about fur seals and other animals on Phillip Island. 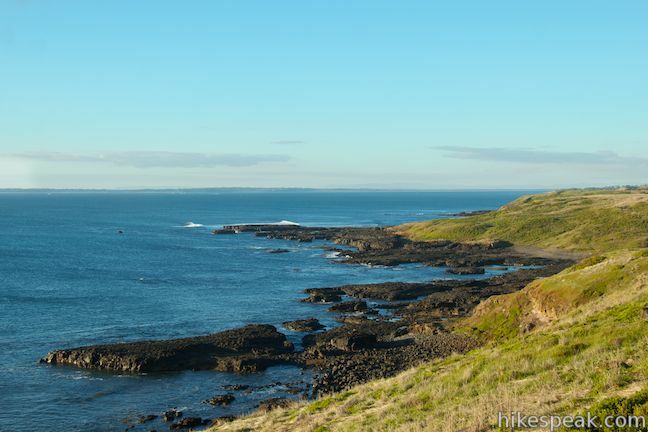 It is important to note that all roads to the Nobbies Centre are closed beyond the Penguin Parade from sunset to sunrise to protect the habitat of the little penguins. Time your visit accordingly. 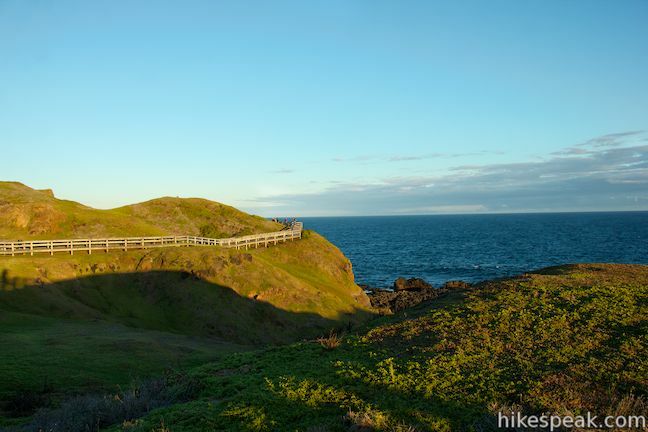 There is a gravel road along the coast between the Penguin Parade and the Nobbies Centre that gets minimal vehicle traffic and offers a good 4-kilometer route for hikers and bikers wishing to explore more of the coast around the Nobbies. 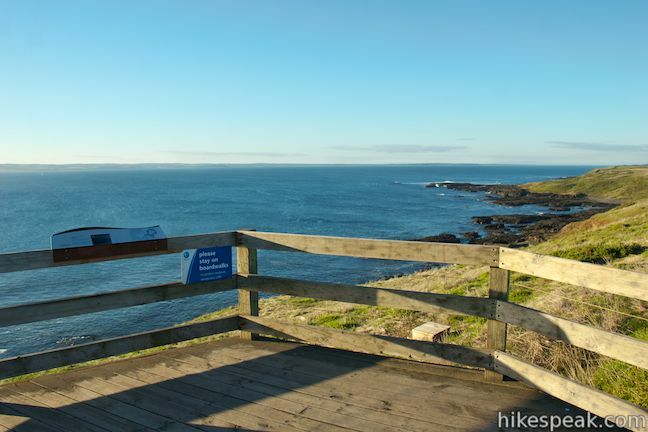 Dogs and bikes are not permitted on the Nobbies Boardwalks. 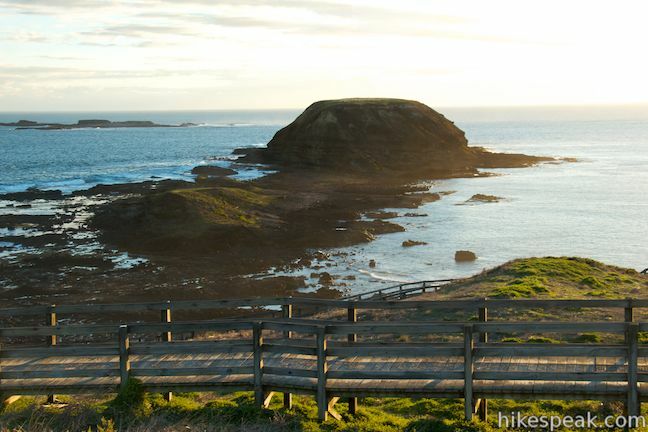 No fee or permit is required to explore Point Grant on Phillip Island, so get out and enjoy! Directions: From Melbourne, take M1 east for approximately 30 kilometers to the exit for South Gippsland Freeway (M420) and drive south for 97 kilometers on M420 following signs for Phillip Island. Bear right onto Phillip Island Road (B420) to cross the bridge onto Phillip Island. Now continue another 8.5 kilometers and bear left at a major split onto Back Beach Road (toward the Penguin Parade). Drive 10 kilometers to the end of the road and turn left onto Ventnor Road. Drive another 4.5 kilometers to the parking area outside the Nobbies Centre at the end of the road. 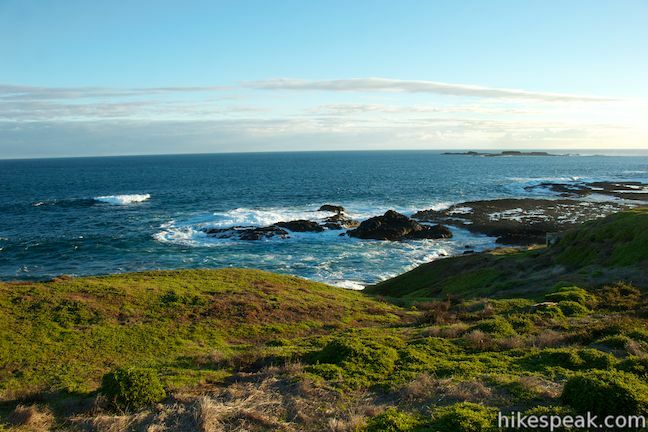 You may also view a regional map of surrounding Australian trails, campgrounds, and lodging. 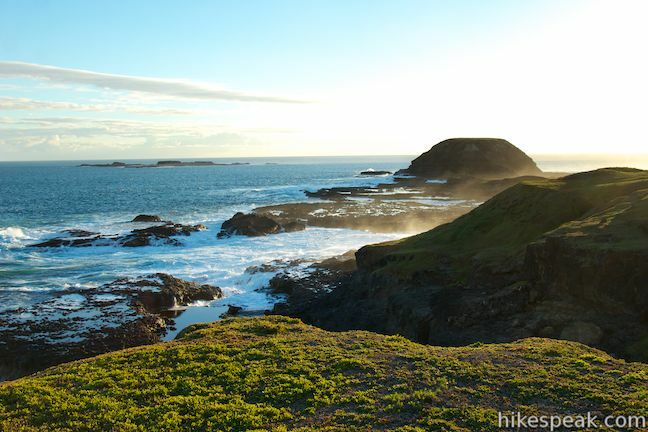 This 4-kilometer one-way road can be walked, driven, or biked between the Penguin Parade Visitor Center and the Nobbies Centre, exploring beautiful coastline along the way (for an 8-kilometer out-and-back return hike). 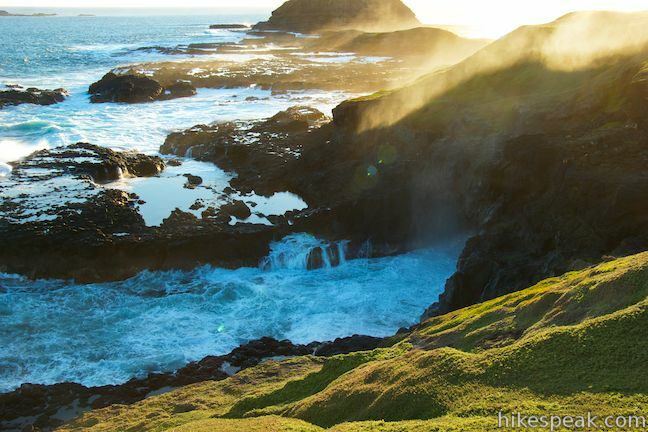 This 1-kilometer out and back return hike brings you to a picturesque surf beach that is taken over by little penguins in the evening. 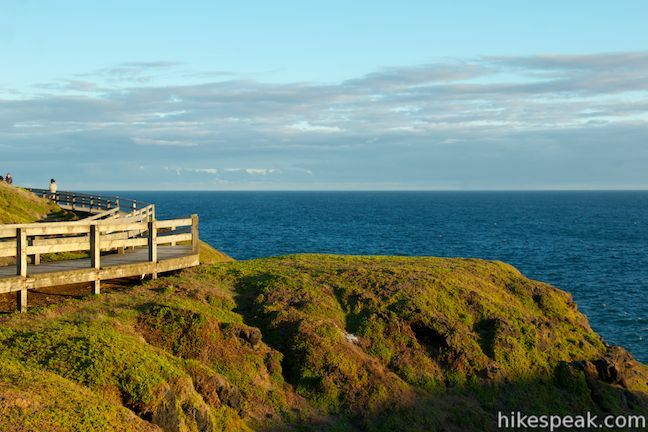 This 1.2-kilometer loop explores the fantastic boardwalks in Phillip Island's Koala Conservation Centre as well as a longer trail through eucalyptus woodlands. 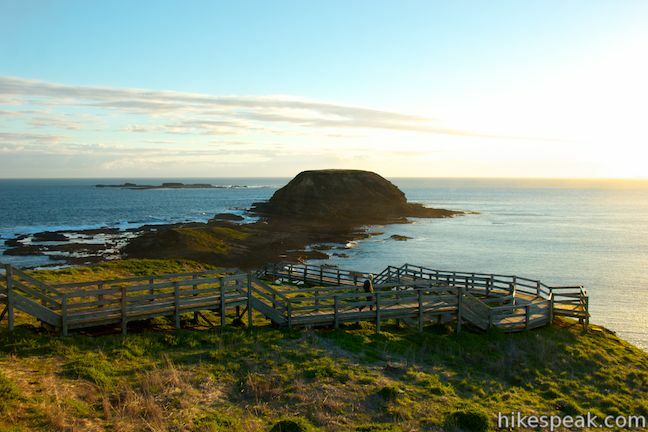 This 0.8-kilometer walk (400 meters one way) takes hikers out onto a grassy point to two overlooks of Pyramid Rock, a triangle-shaped rock island just off the southern coast of Phillip Island. 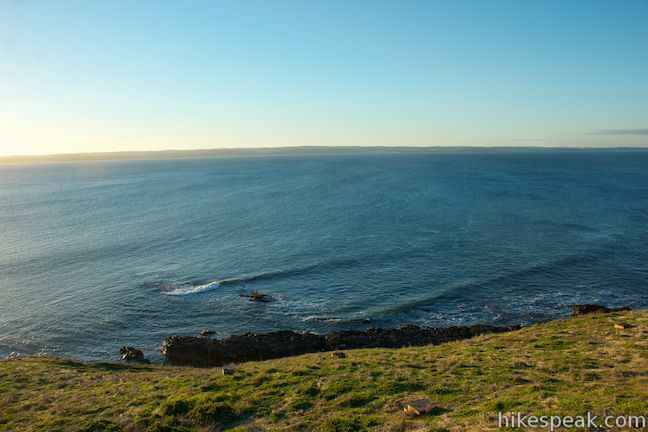 This 8.5-kilometer loop along beaches and bluffs is packed with Cape Woolamai highlights, including Woolamai Surf Beach, the Pinnacles, Cape Woolamai Beacon, Old Granite Quarry, and Cleeland Bight. Explore other destinations in Victoria and Tasmania, Australia. 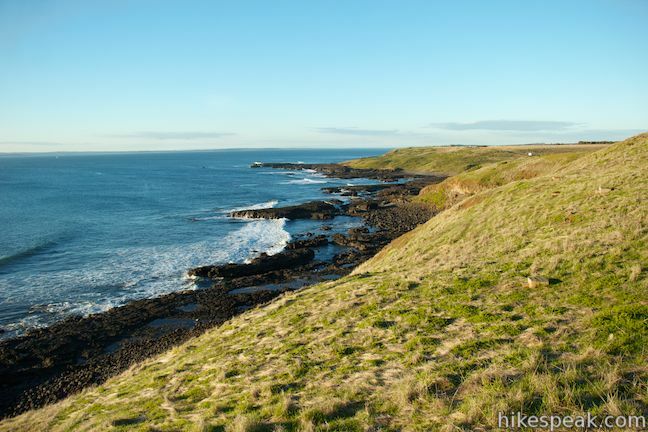 This holiday park offers convenient cabin and camping accommodations on the east end of Phillip Island. When to see the gulls nesting from the boardwalk?